A spectrum (the plural is spectra) is a graph of the amount of light something gives off (how bright the object is) at different wavelengths. In the spectra of stars, we frequently do not know the distances to the stars, so a star's spectrum shows how bright it appears from Earth. The peak emission of their thermal radiation (the continuum peak in the spectrum above) comes at a wavelength determined by the star's surface temperature — the hotter the star, the bluer the continuum peak. 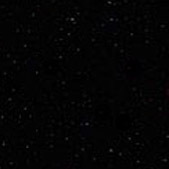 In addition to the continuous spectrum, a star's spectrum includes a number of dark lines (absorption lines). 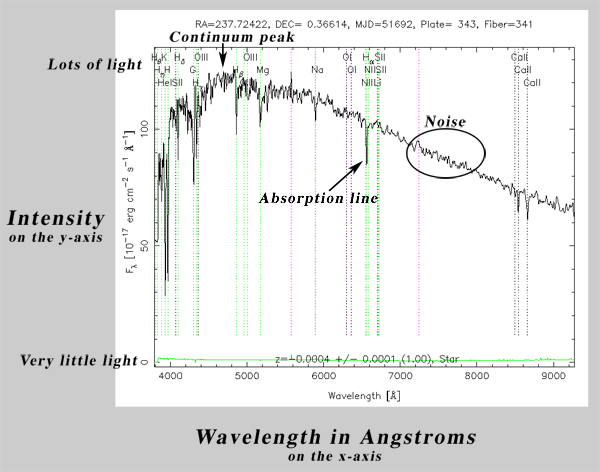 Absorption lines are produced by atoms whose electrons absorb light at a specific wavelength, causing the electrons to move from a lower energy level to a higher one. This process removes some of the continuum being produced by the star and results in dark features in the spectrum.